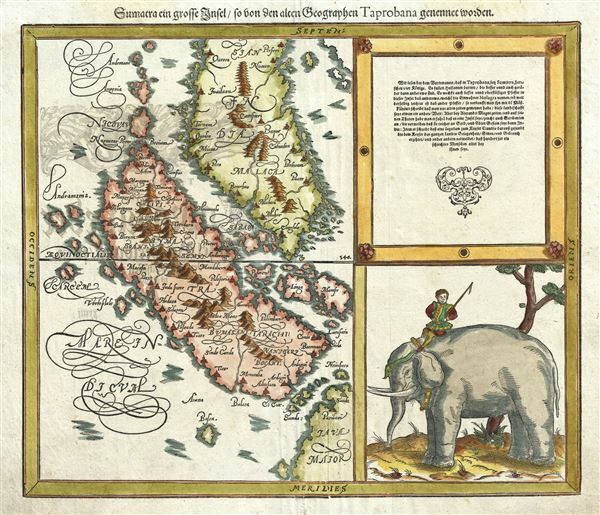 One of the earliest known recognizable maps of Malay and Sumatra. Sumatra ein grosse Insel so von den alten Geographen Taprobana genennt worden. This map is an update of an early map by Munster issued in 1550. There was a great deal of confusion in 16th century Europe with regard to the island of Tapobrana. While Tapobrana is most commonly associated with Ceylon (Sri Lanka), from the 15th century onward it was also identified with Sumatra. The earliest editions of Munster's Cosmographia featured a similar map that resembled Ceylon in form, but was positioned relative to the Malay Peninsula and the Equator where Sumatra actually rests. He updated the map in this, its second edition, to more accurately portray Sumatra both inform and content. This map was drawn by Sebastian Henric Petri, Munster's step-grandson. It seems that Sumatra was surprisingly well known at the time with numerous locations correctly identified. Malay is far more vauge, though the cartograph does successfully name Queda (Kedah), Pera (Perak), Malacca, Muhar (Muar), Paam (Pahang), and Calanton (Kelantan). An elephant and mahout appears in the lower left quadrant. The upper right quadrant includes a quotation from Pliny. Issued in the 1588 edition of Sebastian Munster's Cosmographia. Munster, S., Cosmographica, (Basel) 1588. The Cosmographia was first issued by Sebastian Munster (1488 � 1552) in 1544. It is considered the earliest German description of the world. In order to produce the Cosmographia Munster put out a call to scholars throughout Germany for cartographic information. The response must have been impressive, especially with regard to far off destinations, for it enabled Munster to compile a work of unprecedented scope and accuracy. The volume proved to be one of the most popular and enduring volumes of the 16th century, appearing in some 24 editions over the next 100 years. The Cosmographia typically consisted of six volumes, each dedicated to a different part of the world. The final edition was issued in 1628, long after Munster himself had passed on. Very good. Minor repairs bottom center. Else clean. German decorative text on verso. Durand, Fr., Curtis, R., Maps of Malaysia and Borneo: Discovery, Statehood, and Progress, no. 13. National Library of Australia, MAP RM 4386. OCLC 308718053.